TOUR GUIDE RESPONSE: Thank you Neil & Pam for this nice review and for visiting my country! Hope you enjoy our carnival this Friday! Shalako is a warm, friendly guy who is as passionate about his country and city as he is knowledgeable. He led us on a relaxed and well designed tour that was tailored to our interests. Highly recommended! 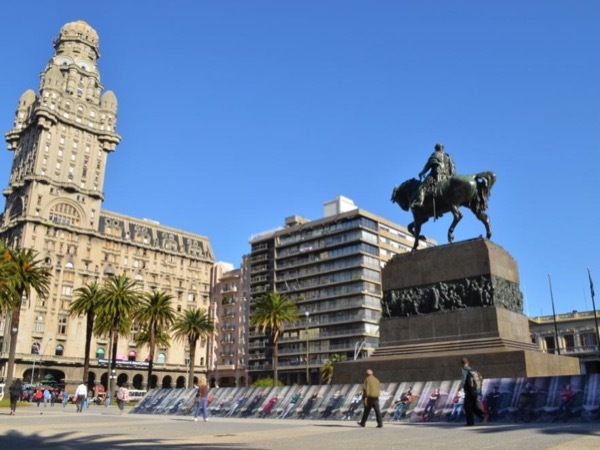 Shslako gave us a great & varied tour of Montevideo combined with stories and discussions about anthing from history to todays politics and real estate prices. He planned the trip according to our interests and gave more of his time than scheduled. We highly recommend Shalako & Tours by Locals! Very friendly and knowledgeable guide. Shalako arranged the tour like we wanted it; laid back in combination with some history, soccer + F&B. We got a good overview of Montevideo. Shalako showed us a lot of Montevideo in the short time of 3 hours our cruise allowed. He even catered to our specific request. It was a great experience. Shalako gave us an interesting and enlightening tour of Montevideo. He shared his obvious love for his city and country with us on a walking tour of the city center and on a car tour of the rest of the city, including various neighborhoods, parks, important buildings and monuments, the Playa and 2 markets. Shalako imparted his vast knowledge of Uruguay's history, culture, politics, and economy in an understandable, relevant manner enlivened with a sense of humor. TOUR GUIDE RESPONSE: Thanks for your kind descriptive comment, Best wishes! Shalako was incredibly knowledgeable and informative and was able to answer even our most esoteric questions. We especially appreciated his insights into the history, development, and culture of Montevideo as well as his flexibility in responding to our needs and requests. Shalako was exactly the type of tour guide we hoped for. He tailored the tour to our interests. Well educated, he informed us about the more recent history of Uruguay, as well as the more distant past and the independence movement of the early 1800's. Thank you! TOUR GUIDE RESPONSE: Thank you for letting me be your host and for taking an interest is such relevant, but usually overlooked issues. Our guide Shalako was very informative and showed us all the sights and took us for an awesome local cuisine lunch. We had a very good time and would highly recommend him as a tour guide. TOUR GUIDE RESPONSE: Thanks David for booking this tour with me! Glad you all enjoyed the "Chivito"